Kamala Harris was mostly raised by her mother. AFRICANGLOBE – Kamala Harris has risen rapidly through the ranks of the Democratic Party and has fast become its front-runner of sorts leading up to electing the candidate for president for 2020. If Kamala Harris must win the nomination for the DNC and become successful against President Trump in the general elections, Kamala Harris must first grab fully, the African American vote, which has become the cornerstone of the Democratic Party’s endeavors. But how to grab that African American vote has become a bone of contention in public view. To this point Kamala Harris claims she is Black. Many prominent Black thought-leaders claim that she is not. 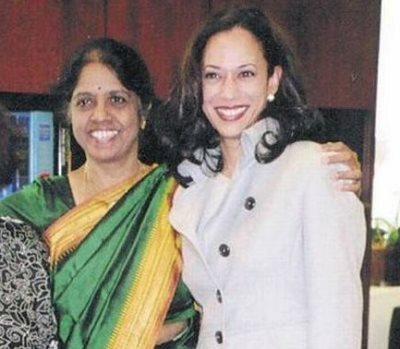 Kamala is the daughter of an Indian (Tamil) mother, and a multi-racial father (who hails from a family in Jamaica that boasts of its Irish Plantation great grandfathers). The basis of Kamala’s heritage as a Black woman stems, obviously, through this storied, yet deeply troubling, multi-racial father. Many Caucasian American news outlets, including the most prominent ones like CNN (the Caucasian News Network), charge Blacks who have openly expressed disgust at Kamala’s claim as a Black woman, essentialists, or more painfully, as Blacks who practice reverse-racism. What is lost in the debate about Kamala’s Blackness or lack thereof, which many Black scholars have indirectly alluded to, is white/Caucasian essentialism itself. What is perhaps also lost is Indian essentialism as well. Why is Kamala Harris not an Indian (or Asian) American? How is Kamara Harris not a Caucasian (or Irish) American? What makes Kamala Harris more an African American than a Caucasian American? What is lost in the debate about Kamala’s Blackness is the question of the essentialism of every other ethnic, or racial group in America. In essence, when Black people question Kamala’s Blackness they also invariably question the prevailing paradigm that anyone in America with just a tint of West African blood should and must be regarded as Black instead of the other. That is not Black essentialism. That is white essentialism. That is Indian essentialism. Hence the charge of “essentializing Blackness” when it comes to Kamara Harris, when carefully scrutinized, rests rather squarely on the shoulders of white supremacists at CNN, MSNBC, and Fox, who indulge in the continued and parochial argumentation that assumes freely that there’s no such thing as white/Caucasian essentialism. The question of Kamala Harris’ Blackness is a deeply white essentialist one rather than not. 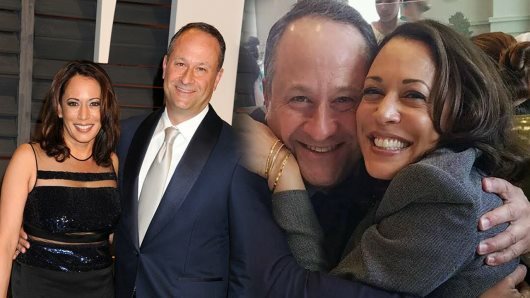 Kamala Harris and her husband Douglas Emhoff. What is troubling even more than the fact that Kamala has more Indian or white ancestry (and to which both races refuse her identification as such) than she has West African ancestry, is the continued entrenchment of the central tenet of the doctrine of white supremacism. To claim that Kamala is Black and not a white woman, for instance, is to enhance the paralogism in public discourse that to be white is to be pure. To say that Kamala is not an Indian American woman also harbors a troubling argument that to be Indian, somehow, is to be also pure. Furthermore, this white essentialism enhances the biologically racist hypothesis, especially pervasive in European textbooks, that labels ‘Blackness’ as a primordial form of humanity which evolves into the most advanced/evolved form of humanity that is whiteness. To be ½ Black is to be Black; to be 1/16 Black is to be Black; to be 1/64 Black is to be Black and so on unless someone is one hundred percent Caucasian then that person is regarded as white. This progression into whiteness is more a theory stooped in an imagined evolutionary trend, which is also known as white supremacism. The charge of essentialism then lies on the lips of media outlets that hold the singular claim that Kamala Harris is African American; and not European American; and not even an Indian American. And so if such a thing exists as European, as Caucasian, as Indian, as African, as Black, and so on, why is it baffling to others that Blacks themselves can also willfully define for themselves what it means to be Black? Is essentialism a reserve for whites and Indians in America alone? In Kamala Harris’ case it seems that essentialism is truly a reserve for white Americans, unless of course the person in question is a half Haitian, half Japanese athlete who has won two Grand Slams back-to-back. How is Kamala Harris African American, yet Naomi Osaka is truly Japanese (as portrayed by the same media as if she was born through Immaculate Conception)? How is Osaka not an African-Japanese woman? That point is lost on the white supremacist media in the United States that masquerades daily as truth-tellers. The point is not that Black people, who will not accept Kamala Harris as an African American woman, indulge in a “reverse-racism,” if that is even a thing. It’s not. Far from it. What is at stake is the battle to unshackle white essentialism (that marches on pointing fingers at others) that is perched at the foundations of American institutions. Kamala Harris should be able to gallivant the outskirts of Philadelphia in the state of Pennsylvania, in redneck country, and speak freely about her heritage as an Irish American in the same way that her fathers have done in Jamaica for a century. The New York Times, CNN, MSNBC and the Huffington Post should then question any rednecks who challenge Kamala’s “proud” Irish plantation masters. But I doubt that would ever happen in American politics, for the very reason that I have underlined: White Essentialism, and with it, white supremacism—an illogical concoction of falsehood carefully fabricated in early European Academia to enhance the European Miracle. What remains in America is a battle of unshackling identities and correcting historical paralogisms. Caucasians can remain Caucasians; Indians can remain Indians, and so must African Americans. That is not to say people don’t mix. They do. But the people reserve the right to identify who is a part of their society as much as the United States reserves the right to identify who is American or not. Previous articleDid This Actress Really Accused Oprah Of ‘Pimping’ Her Out To Harvey Weinstein?